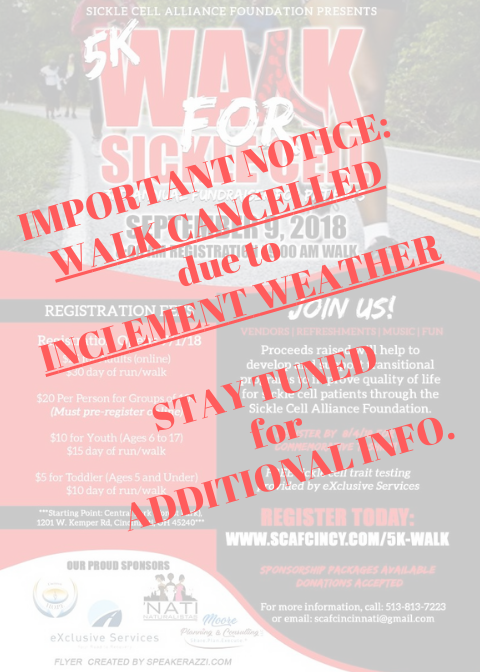 The Sickle Cell Alliance Foundation cancelled its 3rd Annual 5K Walk/Run for Sickle Cell scheduled for Sunday, September 9, 2018 due to forecasted inclement weather predicted to arrive from Hurricane Gordon. Even with inclement weather conditions, just like our sickle cell warriors, we WILL NOT give up; and we WILL still celebrate and bring awareness to sickle cell! Therefore, in honor of National Sickle Cell Awareness month, the Sickle Cell Alliance Foundation team has scheduled a new date to have a smaller-scale indoor recognition event that will be held on Tuesday, September 25 from 5pm-8pm at eXclusive Services, 11134 Luschek Drive, Cincinnati, Ohio 45241. We will email a flyer with details next week so please keep a look out for it. ​UPDATE: Register by 8/22/18 (v. 8/4/18) to get a commemorative t-shirt! Proceeds raised will help to develop and support transitional programs to improve quality of life for sickle cell patients. Sickle cell is a life-threatening disease that affects all races. Learn more.